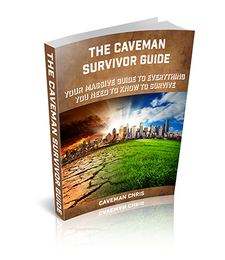 Get Your FREE Copy of The "Caveman Survivor Guide" NOW! When the Federal Government is abolished... When there is no law enforcement or technology left to speak of... You're going to need a way to not only just survive, but evolve to your new surroundings. And no other creature in history has done so more than the caveman. With my 13 years (and counting) living 6 days of the week off the grid, what I have spent the better part of a decade creating is the 'Last Stop' guide to Anarchic Survival, to guarantee your family stays safe during Government Collapse, Financial Crisis, as well as other Society crippling disasters. My friends call me 'Caveman Chris', since my self-inflicted living patterns mirror not only our pioneer forefathers but also our ancient caveman ancestors by design, as I MUST be prepared for when there is no technology or law enforcement around to protect us... And today, I'm here to give you over 13 years of my blood, sweat and tears in the ULTIMATE free step-by-step guide to Survival... So you can protect and care for your family once all hell breaks loose. I crafted the 'Caveman Survivor Guide' from the outset to make sure it's so simple to grasp that ANYONE can use it, yet intricate enough for even the most advanced survivalists... No matter if you're a White Collar professional in Manhattan, an everyday Soccer Mom from Wisconsin, or a Bear Grylls level survival expert roaming the heated Safari's of Africa: Caveman Survivor has something not only powerful, but lifesaving that will quickly and easily evolve your level of Survival 'know-how' like never before. I make sure your family never goes hungry with my detailed instructions on stocking up on all the right foods, as well as building your very own 4 foot garden and 10 minute traps, so you can quickly catch food in any survival situation. With all the grocery stores closed, these practiced secrets will guarantee your family's rib cage is never visible to the touch. When off the grid, even more important than food is clean water for you and your family to consume and use to bathe. With no faucets or even waterholein sight, my unique methods to turn inconsumable H2O into an endless drinking and bathing supply will guarantee your family stays healthy, hygienic, and hydrated for the long haul. I don't want you to assume sleeping in the woods is a 'pre-requisite' to surviving during anarchy: The included limited-edition 'Bunker Bible' will show you 7 different designs on how to build your very own underground bunker or private shelter, for next to nothing. Protect your family from thugs and predators by stocking up on over 10,000 bullets and correlating guns, while making sure that Big Government never has a clue. And in the unlikely event you run out of ammo or need to share some with friends, I'll teach you how to create your very own unlimited supply of ammunition from scratch, as well as other vital weapons for survival. You won't be able to run down to the shop to buy bullets when an economic system ceases to exist: I'll show you how to protect yourself and your loved ones when it comes down to YOU vs THEM. Making sure your family doesn't starve, dehydrate, or get taken out by ruthless thugs is vital, but I also made sure to go in depth on the #1 Killer during any crisis that most overlook: disease and infection. I've personally traveled the WORLD to gather life saving 3rd World medical secrets first hand, and the reason is simple: America, being the most advanced country on Earth, uses a ton of technology for its medicine and treatments... What will you do when there's no Hospital? No MRI scanner? Not even a pharmacy to fill prescriptions? I cover it ALL and show you how to heal and care for your family, 3rd world style, when all the fancy technology and medicines we have today ceases to exist. ...and I will teach and handhold you to learning so much MORE... You'll discover EVERY SECRET to survival I know, without having to suffer through the 13 years of hermit induced agony to get there! SPECIAL LIMITED TIME BONUS - Once you request your FREE copy of the "Caveman Survivor Guide" today, you will also be granted access to a free 15-Day trial to my super secret membership, 'Caveman Survivor: Evolved'which will give you ongoing, updated, and ever progressively advanced methods to survival. The fact is: as time goes on, things change, events happen in the world, and new discoveries are made. To guarantee your family stays on the cutting edge of survival, I will update you with continuous priceless skills, secrets and methods to long term survival. You will receive in-depth exclusive training courses that will give you step by step instructions on how to survive ANY crisis or disaster to come your way. Besides sharing all my expert knowledge, I'm also going to offer you free equipment. Survival necessities such as knives, tools, water purifiers, firestarters, flashlights and more starting today: just to do everything in my power to make sure you and your family stay prepared without too much extra hassle. At the end of your 15-day Free trial, you'll be billed the discounted rate of just $14.95 per month, which we'll charge to the same credit card you use today. At any time, and I mean ANY TIME, you decide to cancel the ongoing progressive content, just shoot us an email and you'll never be billed again, period. (Though normally 98% of survivalists stick around, as they find the updates indispensable to their family's wellbeing). Friend: The next time you look a family member in the eyes to tell them 'I love you' ... Though I know you truly mean it... Take the steps you must take today to PRESERVE that love, by getting your FREE 'Caveman Survivor Guide' right now... Because once the Government collapses and all hell breaks loose, those 'I Love Yous' are going to ring HOLLOW as a drum if you don't protect your family with this FREE guide today. You have nothing to lose, only the Love and survival of you and your family to maintain. You Only Pay $4.95 Shipping & Handling! after your initial charge has been made until canceled. "This is now the 3rd survival guide I’ve purchased, and I guess 3 times is really the charm. So many topics covered across over 600 pages, my wife has started to joke that I "think I'm a survival Guru", hah. Give me another week or so and she’ll be right. Incredible stuff..."
"Being a single mom, I had no idea how I’d protect my family during Government collapse. I don't own a gun, don't have a ton of money to spend, and have never even been camping... Just the thought of trying to prepare for and survive during a crisis had me terrified, but Caveman Survivor has taught me so much, I'm no longer paranoid about what's coming. Can't thank you enough." "I was one of those survival "know it alls" ... but after reading this, I feel I went from a nurse to a Doctor... A paralegal to a Judge... my knowledge before and after doesn't even compare..."
"I had 0 survival knowledge before getting this guide, and now I feel like a pro. I was intimidated at first, thinking "Survival is a 'man' thing"... but it’s so simple to pick up on it didn’t even matter. Just wish I'd gotten this sooner." ClickBank is the retailer of products on this site. CLICKBANK' is a registered trademark of Click Sales, Inc., a Delaware corporation located at 917 S. Lusk Street, Suite 200, Boise Idaho, 83706, USA and used by permission. ClickBank's role as retailer does not constitute an endorsement, approval or review of these products or any claim, statement or opinion used in promotion of these products.